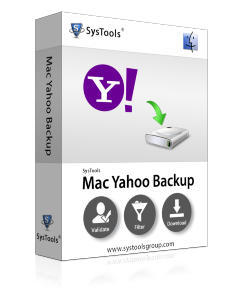 The Mac Yahoo Backup tool allows you to backup yahoo email of a single user account. One can export yahoo mail folders like Inbox, Outbox, Sent Items, Draft etc. by providing valid Yahoo mail account credentials. MacWareTools Yahoo backup allows you to export yahoo emails to PST, EML, MSG, EMLX & MBOX formats. Software does not require to have any email client to be installed to take Yahoo mail backup. The Mac Yahoo backup software enables you to take backup of selected folders. For this, you just need to type the exact name of the folder, you want to backup. This will save users time and disk space by excluding unnecessary folders. With this MacWareTools Yahoo backup tool, One can exclude Deleted or Sent Items folders. The software has two different options to remove these folders from the backup. You just need to check Exclude Sent Items and Exclude Deleted Item options for this. 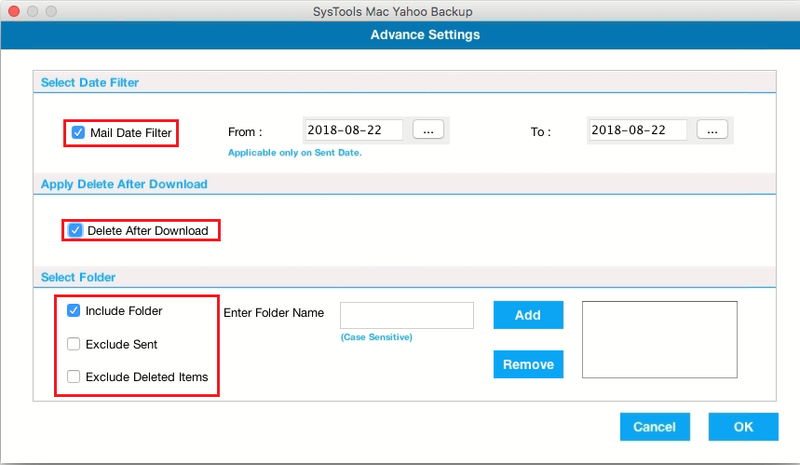 The Yahoo backup software for Mac provides you the option to export the Yahoo account emails of specific date range by applying date filter option. For this, you just need to select the date range in email filter option and the software will export emails of that time interval. The MAC Yahoo mail backup tool, not only takes the backup of emails, It allows you to erase the emails on Yahoo account which has been backed up by the software. This is an additional feature which helps you to regain the Server Space. 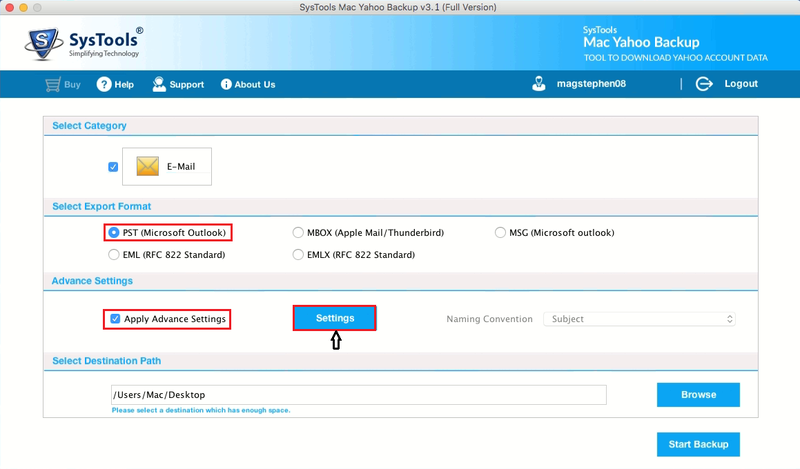 The MacWareTools Yahoo backup software has an option to backup Yahoo emails with incremental backup option. For this, You first need to export yahoo emails to your computer. Then, from the next time, If you are taking an incremental backup on the same machine of that account, then the software will create a separate file for new emails which has not been archived earlier. If a user exports Yahoo emails to EML, MSG or EMLX formats using Yahoo mail backup tool, then the software will allow you to provide naming convention like subjects, DD-MM-YY, Auto incremental, etc. to arrange the emails according to the need. 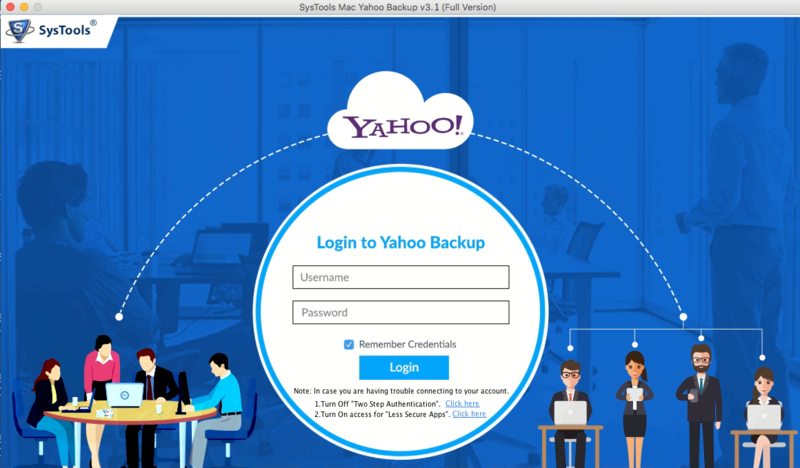 How Mac Yahoo Mail Backup Tool Works? I am a MAC user and having an account of Yahoo Mail. From the last 4 months I was searching that how can I take backup of all my selective mails from Yahoo Mail. But thanks to this Yahoo Mail Backup Software, you have done a great job as this software is the best to export yahoo emails on MAC. The best thing about this Yahoo backup tool is to export the Yahoo Mails into multiple formats. I was searching for the software that helps me to backup all my mails into PST format and this tool helps me a lot. Thanks to you MacWareTools. This software is one of the best software that I used to backup all my mails. As I want to secure my data from any malicious attack I used this software and it works amazing. There are many software for backup Yahoo mails, but this Yahoo Email Backup tool is very satisfactory for me. It helps me a lot for securing my data. 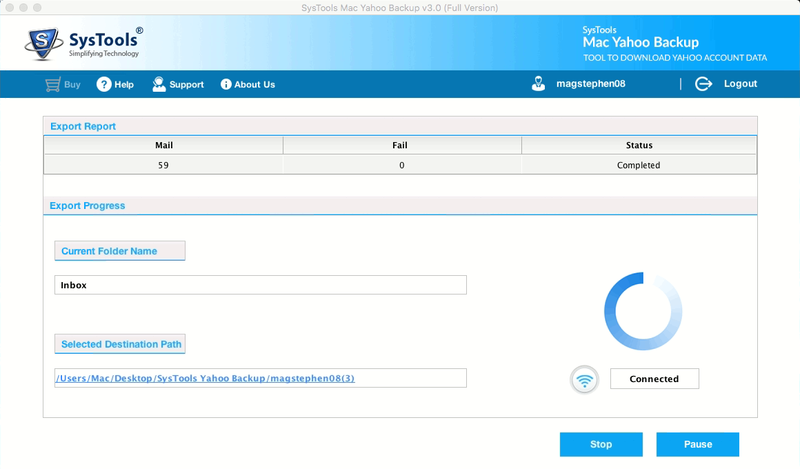 Demo Version of Mac Yahoo Backup tool will take backup of 100 emails from Yahoo account into PST, MSG, EML, EMLX and MBOX format. Can I take backup of my inbox with Mac Yahoo email backup tool? Yes, this Yahoo backup software for Mac allow you to export Yahoo mail folders to your computer. The software takes backup of single user account. Is it possible to export Yahoo emails to PST, MBOX, EML, MSG & EMLX formats? Yes, the software helps you to backup Yahoo mails to PST, MBOX, EML, MSG & EMLX format. Does this software require to have installed any email client to take Yahoo mail backup? No, MacWareTools Yahoo backup tool doesn’t require for any email client to be installed to export Yahoo emails to your MAC computer. How do I know if any email item failed during Yahoo mail backup process? The software generates a complete report of source count, download count, file count and allow you to export it as a CSV format. Can I take the backup of selected emails using this software? Yes, Yahoo backup software has an option to export selected emails using date filter option. You just need to select the date range for a specific time interval. You have not chosen no. of accounts.